A well-researched and great introduction to the concept of income inequality in the United States. Shapiro, through hours and hours of interviews paints a personal picture of what it means to be financially insecure and how our system (sometimes even when it's well-intentioned) perpetuates economic and racial divide. He doesn't just lay on the problems though, there are plenty of solutions suggested in this book as well. Since the Great Recession, most Americans' standard of living has stagnated or declined. Economic inequality is at historic highs. But inequality's impact differs by race; African Americans' net wealth is just a tenth that of white Americans, and over recent decades, white families have accumulated wealth at three times the rate of black families. 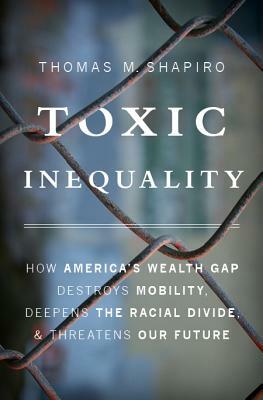 In our increasingly diverse nation, sociologist Thomas M. Shapiro argues, wealth disparities must be understood in tandem with racial inequities--a dangerous combination he terms "toxic inequality." In Toxic Inequality, Shapiro reveals how these forces combine to trap families in place. Following nearly two hundred families of different races and income levels over a period of twelve years, Shapiro's research vividly documents the recession's toll on parents and children, the ways families use assets to manage crises and create opportunities, and the real reasons some families build wealth while others struggle in poverty. The structure of our neighborhoods, workplaces, and tax code-much more than individual choices-push some forward and hold others back. A lack of assets, far more common in families of color, can often ruin parents' careful plans for themselves and their children. Toxic inequality may seem inexorable, but it is not inevitable. America's growing wealth gap and its yawning racial divide have been forged by history and preserved by policy, and only bold, race-conscious reforms can move us toward a more just society.